**Update** The Print edition is now released for your enjoyment. Purchase now: Kindle versions on Amazon.com, Amazon.co.uk, and multiple formats on Smashwords . Imagine an island world where the seas seethe with dangerous creatures, where those rare men and women called Bard-Navigators have learned to sing Whales to protect their ships. Only on the wings of Bardsong can ships avoid the Sea-Dragons and travel the great gulf between the Atolls scattered across the World-Sea. Tales and travails wreathed in mystery. Zhialeiana has an astonishing gift of song. She can sing the unique songs of the mighty and magical creatures of the World-Sea. She can touch their souls. When her gift is discovered at her mother's funeral, the current of her life begins to sweep her to a future that she could never have imagined. 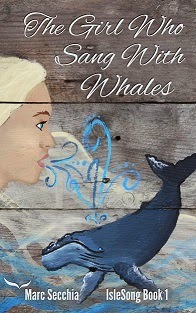 She must navigate both opportunity and danger, and lay her life on the line for the Whales she loves. But Zhialeiana also has a toxic secret - a secret that will force her to undertake a journey beyond faith, beyond all hope, and beyond the World-Sea. The cover art is by Corinna Spiekermann.